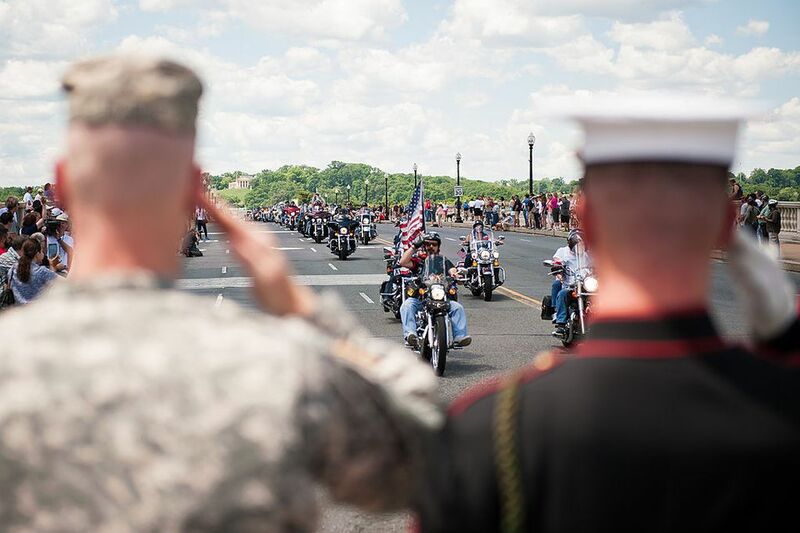 A Guide to Rolling Thunder 2019: Motorcycle Rally in Washington, D.C.
Rolling Thunder is an annual motorcycle rally that is held in Washington, D.C., during the Memorial Day weekend to call for the government's recognition and protection of Prisoners of War (POWs) and those Missing in Action (MIAs). The tribute to American war heroes started in 1988 with 2,500 participants. Now approximately 900,000 participants and spectators are involved with this annual demonstration in Washington, D.C. Rolling Thunder is one of the best patriotic events held in the nation's capital and a unique experience not to be missed. Follow this schedule of events for 2019. 9 a.m. to 9 p.m.: Thunder Alley, the official vendor hub for Rolling Thunder, opens to visitors. Shop for souvenirs and biker equipment and grab some food. It's located at 22nd and Constitution Avenue NW. 6 a.m.: Reveille for riders at the Vietnam Veterans Memorial—bikers meet in North and South Pentagon parking lots at 7 a.m. If it's your first time visiting the event, consider these tips. The best viewing spots are along the Arlington Memorial Bridge and Constitution Avenue. Streets will be closed along the route from 10:30 a.m. to 4 p.m. Parking is limited. Taking public transportation is suggested. Stations nearby include Smithsonian, Metro Center, Judiciary Square, Federal Triangle, and L'Enfant Plaza. Bring food and water or expect to wait in line. Dress appropriately and wear comfortable shoes. Take some time to pay tribute to America's war heroes by visiting the monuments and memorials on the National Mall. Bring your patriotic spirit and enjoy the day! Rolling Thunder began as a demonstration following the era of the Vietnam War, which was a difficult time in America's history—our nation was divided over issues of peace and war. Many of America's military service people were killed or went missing in action, and their remains were not being brought home to be respectfully buried and honored. In 1988, veterans of the Vietnam War rallied together with their families, fellow veterans, and veterans' advocates to organize a demonstration at the Capitol Building in Washington, D.C., over Memorial Day weekend. They announced their arrival with the roar of their Harley-Davidsons, a sound not unlike the 1965 bombing campaign against North Vietnam named Operation Rolling Thunder. Approximately 2,500 motorcycles participated in this rally, demanding that the U.S. government account for all POW/MIA's. The group became known as Rolling Thunder and each year since has held an annual "Ride for Freedom" to the Vietnam Veterans Memorial Wall. Rolling Thunder was incorporated as a class 501 C-4 non-profit organization and today has more than 100 chapters throughout the United States, Canada, Australia, and Europe. The group is actively involved year-round in promoting legislation to increase veteran benefits and resolve the POW/MIA issue from all wars. They also provide financial support, food, clothing and other essentials to veterans, veterans' families, veterans groups, and women's' crisis centers.